Welcome to Prince Rupert, a bustling coastal town providing a gateway to British Columbia’s pristine North. Meet your fellow travellers this evening at a Welcome Dinner in anticipation for the adventure that lies ahead! On board a BC Ferry, we sail from the mainland and begin our scenic journey across the Hecate Strait to Haida Gwaii. 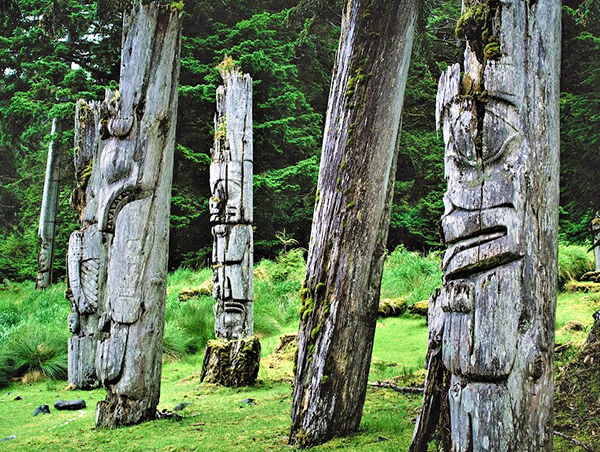 Haida Gwaii, meaning ‘Islands of the People’ is an archipelago of over 150 islands with an incredible history surrounding the culture of the Haida People who first inhabited these islands over 10,000 years ago. We sail through the scenic Hecate Straight, named for the HMS Hecate used for surveying these waters in the 1860’s. Thousands of years before being named the Hecate Strait, the strait was both a transport route to the mainland land, with its shallow waterways providing a navigational challenge to outsiders, and a source of protection for the Haida people. This afternoon we arrive in Haida Gwaii and travel to the Queen Charlotte City accommodation. Enjoy the evening at leisure to explore the quaint island village. Today a local guide joins us as we travel to the north end of Graham Island, the largest of the islands that form Haida Gwaii and visit the village of Masset. In Masset we visit the Dixon Entrance Maritime Museum which showcases the diverse history of Masset and the first settlements in the area. Continuing on we visit Old Masset, the site of three traditional Haida Villages and now known for the eclectic mix of artisans whose studios line the street. Take some time to meet the artisans and learn about their art featuring silver, gold, and argillite carvings, prints and one-of-a-kind paintings. Naikoon Provincial Park, the ancestral home of the Gwak’rala’chala people, is known for its pristine wilderness dotted with cultural sites and seemingly endless rugged coastline where we can explore both Agate and North Beach. At Tow Hill we take a short walk along the boardwalk to the Blowhole where the force of the ocean is on full display as water shoots through the blowhole with each wave coming in. 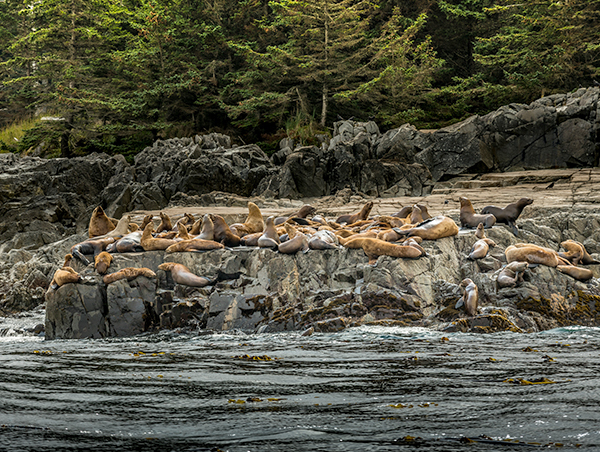 This morning we board zodiac vessels and travel the coastal waters to the edge of Gwaii Haanas National Park to the Skendans, known locally as ? 'uuna Llnagaay. Our journey today is filled with storytelling and songs of the Haida People while exploring the coastlines filled with sea lion rookeries. 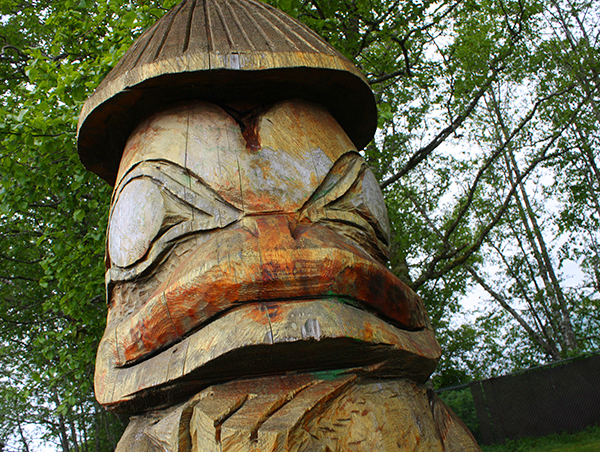 At the village site of ?’uuna Llnagaay, a National Historic Site of Canada, an interpretive tour allows us to fully immerse ourselves in the incredible history, culture and way of life of the Haida People who once inhabited the village. After an incredible day, we arrive back in Queen Charlotte City this evening. Travelling a short distance to Port Clements, an active forestry area where we visit the Port Clements Museum and learn about the past and present conditions of the forestry industry on the islands. A short walk from the museum we join the Golden Spruce Trail for a short, easy hike. The Golden Spruce trail, named for the Golden Sitka Spruce that once grew at the end of the trail. The Golden Sitka Spruce, a spruce tree that grew for nearly 300 years had a mutation causing the spruce to grow needles of a golden yellow colour. A sapling was saved when the original tree grew and had been nurtured and grown at the Port Clements Memorial Park which we will visit after hike along the trail. This afternoon we visit Tlell, home to a variety of local artisans and take time at leisure to visit their shops and learn of their craft first hand. Our day concludes with visiting St. Mary’s Spring where, if desired you can taste the fresh spring water which, according a to local lore, a drink from the well will bring you back to Haida Gwaii later in life. Finally, we visit Balance Rock, a remnant of the Ice Age that looks precariously posed on the coast, but is in fact, firmly in place and immovable! Our final day in Haida Gwaii is spent at the magnificent Haida Heritage Centre. The Haida Heritage Centre is a magnificent showcase of the Haida People, culture and way of life, highlighting the traditions of all fourteen Haida Clans. With an interpreter of the Haida Centre we enjoy an interpretive tour of the facility followed by ample time to experience the exhibits at leisure. This evening we finish our journey with a traditional Haida Feast hosted by a local and accompanied with stories and tales of the host families clan. Following dinner, we once again board a BC Ferry and sail overnight in comfortable sleeper berth accommodation to Prince Rupert. We arrive in Prince Rupert early this morning and enjoy one last breakfast today before beginning our journey home.